An FDA-cleared, computerized, and objective measure of attention and inhibitory control normed by gender for ages 4 to 80+. The T.O.V.A. provides healthcare professionals with objective measurements of attention and inhibitory control. The visual T.O.V.A. aids in the assessment of, and evaluation of treatment for, attention deficits, including attention-deficit/hyperactivity disorder (ADHD). The auditory T.O.V.A. aids in the assessment of attention deficits, including ADHD. T.O.V.A. results should only be interpreted by qualified professionals. The T.O.V.A. is a culture- and language-free, sufficiently long computerized test that requires no left/right discrimination or sequencing. Responses to visual or auditory stimuli are recorded with a unique, highly accurate (±1 ms) microswitch. The T.O.V.A. calculates response time variability (consistency), response time (speed), commissions (impulsivity), and omissions (focus and vigilance). These calculations are then compared to a large age- and gender-matched normative sample, as well as to a sample population of individuals independently diagnosed with ADHD. These comparison results are used to create an immediately available, easy-to-read report. The T.O.V.A. provides information that is not available through self-report or the report of others. It is used along with a clinical interview and subjective measures (such as behavior ratings) for a more comprehensive picture of academic, social, and personal performance and impairment. T.O.V.A. results should only be interpreted by qualified healthcare professionals. Unfortunately for test makers, computers share one of the most common traits seen in ADHD: inconsistency of performance. 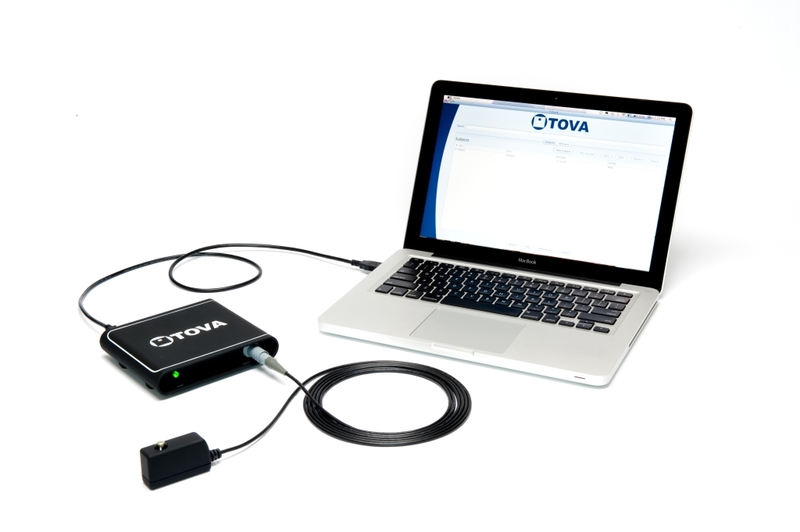 The TOVA Company designs and builds hardware and software that addresses this problem, enabling your computer to measure with millisecond accuracy. The T.O.V.A. USB device and microswitch (with photodiode) ensure accuracy of timing measures and comparison to normative and sub-group samples. This uncompromising approach to timing ensures accurate results. The T.O.V.A. system includes: a USB flash drive with software installer for Mac and Windows PCs, a T.O.V.A. USB device, a T.O.V.A. Microswitch, an Installation Guide, a User's Manual, a Clinical Manual, and USB, VGA, and audio cables. To purchase the T.O.V.A., please see our ordering information, or simply contact us.